1. Denis Skorobogatko et al. report headlined "Sergei Chemezov gets independent look" says Rostekh head Sergei Chemezov is to chair the board of directors of the Norilsk Nickel mining and metals company; p 1 (536 words). 2. Yelena Chernenko article headlined "ABM to get presidential guarantee" says that Moscow and Washington seem to have resolved the missile defence problem, as the presidents of the two countries are to exchange political declarations guaranteeing that they will not use their missile forces against each other; pp 1, 8 (687 words). 3. Kirill Melnikov et al. report headlined "Rosneft finds second way to China" outlines Rosneft plans to increase oil supplies to China by 9m tonnes a year; pp 1, 11 (912 words). 4. Svetlana Dementyeva article headlined "Otkrytiye asked to pay for VEFK accounts" says the bank Otkrytiye, being the legal successor of the bank VEFK, which went bankrupt during the financial crisis in 2008, now has to deal with claims by the Chinese clients of VEFK; pp 1, 10 (1,019 words). 5. Yulia Rybina article headlined "One could not form it better" reports on the new presidential administration in Dagestan formed by acting head of Dagestan Ramazan Abdulatipov; p 2 (697 words). 6. Sergei Goryashko and Maxim Ivanov article headlined "Sergei Shoigu outstrips Dmitry Medvedev" says that a public opinion poll has shown that Defense Minister Sergei Shoigu enjoys greater support of the electorate than Prime Minister Dmitry Medvedev; p 2 (514 words). 7. Grigoriy Tumanov article headlined "Marches step on each other's heels" says the Moscow mayor's office has authorized a rally against foreign adoption of Russian children to be staged in the city on 2 Match, which is the same day when the opposition plans its protest; p 3 (435 words). 8. Olga Allenova article headlined "Russia carries out adoption" outlines the measures developed by the State Duma to encourage people to adopt more orphans; p 4 (1,757 words). 9. Olga Allenova interview with the president of charity fund Volunteers to Help Orphans, Yelena Alshanskaya, saying that the measures adopted by the authorities are not enough to reduce the number of orphans in Russia; p 4 (530 words). 10. Maksim Yusin article headlined "Egyptian opposition loses common language" comments on the rift within members of the Egyptian opposition who cannot come to agreement over the parliamentary election boycott; p 7 (405 words). 11. Kirill Belyaninov article headlined "Americans warned about personnel cuts" says the US presidential administration has warned the Republicans about the consequences of the fiscal cliff if the party does not agree to find a compromise on the fiscal policy; p 8 (586 words). 12. Galina Dudina article headlined "Italy shows moderation" looks at the early results of the parliamentary election in Italy; p 8 (634 words). 13. Article by Anatoly Adamishin, former Soviet and Russian ambassador to Italy, in opinion column headlined "Price of issue" says that judging by the Italian election results, the country has chosen reforms and economic development in the future rather than populist promises by Silvio Berlusconi; p 8 (358 words). 14. Pavel Tarasenko article "Road being cleared for young people in Cuba" says that Cuban leader Raul Castro may step down in 2018; p 7 (700 words). 1. Alexandra Samarina article headlined "Liberal face of ruling party" looks at a manifesto published by the liberal wing of One Russia and says that it has become the ruling party's response to the changing political landscape in the country; pp 1, 3 (1,135 words). 2. Svetlana Gamova article headlined "Magnitsky list splits Moldovan elite" says the Moldovan parliament has started an inquiry into the work of the bank suspected of involvement in money laundering committed by the Russian officials included in the so-called Magnitsky list; pp 1, 6 (881 words). 3. Sergei Kulikov article headlined "Tariffs go crazy" says President Vladimir Putin has criticized the government over a hike in utilities tariffs which amounted to 200 per cent in some regions. Experts say the prices are soaring due to growing prices on gas; pp 1, 4 (796 words). 4. Vladimir Mukhin article headlined "Fifth squadron to return to Mediterranean Sea" says that a squadron of Russian warships will operate on a regular basis in the Mediterranean starting from 2015; pp 1-2 (731 words). 5. Tatyana Ivzhenko article headlined "Ukrainian cannot be fooled with cheap sausage" looks at the food pricing policy adopted by the Ukrainian authorities and warns that it may cause serious economic and social problems; pp 1, 6 (679 words). 6. Vladimir Skosyrev article headlined "Barack Obama does not want to quarrel with Beijing" says that Japan has failed to receive the USA's support in its territorial dispute with China. Washington must be pushing Tokyo towards a compromise with Beijing, article says; pp 1, 7 (506 words). 7. Editorial headlined "Civil, but not political victory" says that opposition blogger Alexei Navalny cannot convert his small victory, One Russia MPs' resignations, into a political capital as he does not have a political party; p 2 (479 words). 8. Nikolai Surkov article headlined "Russia tries to save Syrian peace settlement" says that recent developments in Syria will become the main topic on the agenda of the Russian Foreign Minister Sergei Lavrov's meeting with his US counterpart John Kerry; p 7 (540 words). 9. Darya Tsilyurik article headlined "Cyprus elects compliant president" reports on the Cypriot presidential election and says that the country still counts on Moscow's financial support; p 7 (687 words). 10. Yury Solomonov interview with professor Igor Yakovenko, who speaks about the political and economic situation in the country and about whether Russia is capable of true modernization; pp 9-11 (5,100 words). 1. Maksim Tovkaylo et al. report headlined "How much are 6 per cent?" says that after Putin has demanded that public utilities tariffs should not go up more than 6 per cent a year, the sector is not going to get new investment; pp 1, 4 (796 words). 2. Yelena Vinogradova et al. report headlined "Construction lesson" says the opening of a stadium in Kazan, which was scheduled for 2012, is now going to take place in June, a month ahead of the World Students Games. The cost of the project more than doubled and it still lacks labor force; pp 1, 18 (594 words). 3. Editorial headlined "Stake on ignorance" says that the majority of Russians, who have a vague understanding of the pension reform, are unlikely to transfer their pension savings to private pension funds and thus, will be stripped of the money they saved as a cumulative part of their pensions; pp 1, 6 (458 words). 4. Alexei Nikolsky and Liliya Biryukova article headlined "Investigation to merge by elections" says the merger of all investigations departments within the Russian Investigations Committee has been postponed until 2016. Only the Federal Security Service is likely to keep its own investigative department; p 2 (506 words). 5. Another editorial headlined "To stamp country" criticizes the controversial bill on the tougher regulation of residential registration in Russia; p 6 (283 words). 6. Roman Dorokhov report "Daily contacts" says that the social network Vkontakte has become leader in terms of the average number of daily users; p 16 (700 words). 1. Pavel Chernyshov article headlined "Finance Ministry spares R1.5bn for orphans" says the Russian Finance Ministry did not want to approve the law on an increase in financial support to families adopting orphans; pp 1, 4 (790 words). 2. German Petelin and Vladimir Barinov article headlined "Serdyukov's protege reaches public utilities sector" says the management of the Remontno-Ekspluatatsionnoye Upravleniye (Repair and Maintenance Directorate) company, being a monopoly supplier of heating to the defense ministry's facilities suspected of stealing R148m (around 4.9m dollars), has claimed that the scandalous Oboronservis company is to blame for the theft; pp 1, 4 (746 words). 3. Mikhail Rubin article headlined "Gudkovs to be expelled from A Just Russia's leadership" says State Duma MP Dmitry Gudkov and his father, former deputy Gennady Gudkov, will be ousted from the leadership posts in A Just Russia over their participation in the opposition Coordination Council; pp 1, 3 (543 words). 4. Alexei Mikhailov and Dmitry Balburov article headlined "Russian Air Force orders killer of Patriots" praises technical characteristics of Su-25 fighters that will be adopted into operational service in 2014; p 5 (569 words). 5. Sergey Podosenov report "Deputies discuss introduction of visas with Central Asia" says that the Communist faction in the State Duma has prepared amendments to the bill on migration; p 3 (650 words). 6. Ilya Yushkov interview with Lyudmila Fomina, the mother of a boy who has died in the house of his adoptive parents in the USA; p 3 (1,200 words). 7. Konstantin Volkov report "New president of South Korea to tempt North Korea with market" looks at South Korea's new president; p 7 (800 words). 8. Vadim Levental report "Instead of McFaul" comments on US ambassador's refusal to come to the State Duma; p 9 (600 words). 1. Irina Nevinnaya and Vladimir Bil interview "Shooting pain" with Federal Drug Control Service head Viktor Ivanov speaking on the possibility to change regulations of supplying terminally ill people with painkillers; pp 1-2 (1,455 words). 2. Yelena Mishina article headlined "Begin to smoke — pay for it" details the new law imposing restrictions on smoking in public places in Russia; pp 1, 7 (850 words). 3. Anna Fedyakina interview with Russian ambassador to Japan Yevgey Afanasyev speaking on prospects for development of Russian-Japanese business ties; p 8 (380 words). 4. Yekaterina Vergiz report "Banished from mosques" says that the Egyptian authorities have banned the use of mosques for political purposes; p 8 (1,000 words). 1. Alexei Steynert article headlined "'Seizure of street' plan implemented in Moscow" says that Federal Security Service personnel have cordoned off part of a road in the center of Moscow; pp 1, 7 (1,135 words). 2. Yulia Kalinina article headlined "Depardieu to become locomotive" says ironically that French actor Gerard Depardieu should visit more Russian regions to promote them among European tourists; pp 1-2 (638 words). 3. Inna Grigoryeva report "Putin crushes utilities workers: You are crazy" looks at a working meeting on housing and utilities problems chaired by Putin; pp 1-2 (550 words). 4. Natalya Rozhkova report "Chepa buys flat in Miami cheap" looks at another scandal over property abroad owned by a A Just Russia deputy; pp 1-2 (600 words). 1. Ivan Petrov article headlined "Army of internal use" says new detachments are to be set up within the Interior Ministry's Internal troops as the Kremlin is worried with the possibility of rioting in the country; p 2 (600 words). 3. Anastasia Novikova and Alexander Litoy article headlined "Agent in national security" says the Russian Justice Ministry is going to label NGOs as foreign agents only after their participation in political activity and the receipt of foreign funding are proved; p 3 (500 words). 4. Galina Starinskaya article titled "Oil for plant" says Russian oil giant Rosneft may boost supplies to China by up to 24 million tonnes; p 6 (400 words). 5. Polina Stroganova article titled "Timchenko eyeing Asia" says the Gunvor oil trader is looking for opportunities to expand its asset ownership in the Asia-Pacific Region; p 6 (350 words). 1. 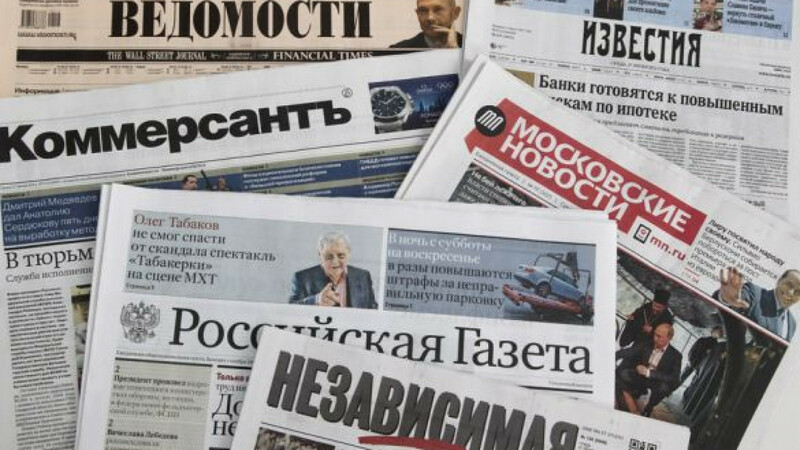 Nadezhda Krasilova article headlined "Fashion for xenophobia" says an increasing number of Russian political parties have started drawing on nationalist rhetoric, however experts doubt this will make them more popular; pp 1-2 (1,074 words). 2.Vera Moslakova interview with retired federal judge Sergey Pashin titled "'Judges' special opinions affect only their own fate'", in which he comments on yesterday's publication of a special opinion by a Constitutional Court judge, which criticized recent controversial amendments to the law on rallies; pp 1-2 (400 words). 3. Sergey Manukov article titled "He will leave and not return" comments on an announcement by newly re-elected Cuban leader Raul Castro that he will not seek another term in office; p 2 (300 words). 4. Diana Yevdokimova article headlined "Bettering experience" says the number of appeals by Russians to the European Court of Human Rights decreased by one-third in 2012 as the Russian authorities hired lawyers to carefully study applications before they go to Strasbourg and reject them over the tiniest technical mistakes; pp 1, 5 (1,093 words). 1. Andrei Drobotov and Vitaly Klimov article headlined "In Chechnya, Gerard Depardieu said he could drink no more" focuses on the French actor's meeting with Chechen leader Ramzan Kadyrov; pp 1, 4 (600 words). 2. Dmitry Smirnov article titled "Vladimir Putin about growing utility rates: 'What, did they lose their minds? Go and explain to people why there was such a hike in February'" says at a meeting with senior officials in charge of utilities, President Putin expressed his extreme dissatisfaction with sharp growth in utilities prices; p 2 (650 words). 3. Alexander Kots and Dmitry Steshin 'special report' from Syria, titled "A Russian woman from Syria: 'I will leave on the last plane and come back on the first'", considers the situation in Syria from the point of view of Russian expats; p 5 (800 words). 4. Kirill Nefedov article titled "March 'in defense of children' to be held in Moscow" looks ahead to a march focused on protecting children's rights, planned for 2 March in Moscow; p 6 (250 words). 5. Under the title "Former UK ambassador in Tashkent Craig Murray: 'London has considered Russia an enemy for the past 200 years,'" Komsomolskaya Pravda reproduces the British diplomat's interview to state-owned radio Voice of Russia; p 7 (1600 words). 1. Vitaly Golovachev commentary headlined "...there is only stealing and arrogance of officials" says President Vladimir Putin lashed out at officials for increases in utilities and municipal services tariffs at a meeting yesterday ; p 1 (400 words). 2. Alexander Protsenko article titled "Very much in time" reviews a meeting of the G20 working group on fighting corruption, which convened in Moscow yesterday; p 2 (450 words). 3. Sergey Frolov article titled "About verbal diarrhoea and how to fight it" criticizes recent comments by Russian children rights ombudsman Pavel Astakhov about the death of a Russian boy adopted by a US family; p 2 (400 words). 1. Anna Baydakova interview with sociologist Igor Zadorin titled "Public without opinion" in which he comments on often surprising results of public opinion surveys in Russia; p 2 (500 words). 2. Irina Granik article headlined "Financial transaction without anaesthesia" says that MPs are none too thrilled about the government's proposed measures to fight money laundering practices; pp B2-B3 (1100 words). 3. Anastasiya Matveyeva article titled "Peculiarities of national capital flight" comments on capital outflow from Russia, which the author says happens irrespective of how well the economy is faring; p B4 (450 words). 1. Unattributed article titled "Over to you, Gerard" gives an overview of Gerard Depardieu's visit to the Chechen capital; p 2 (250 words). 2. Unattributed article titled "Pour us one, genatsvale! [Georgian for 'dear]" says a delegation of Russian officials is visiting Georgia to inspect the country's wine-making facilities, a step towards lifting the import embargo on Georgian wine and water to Russia; p 2 (100 words).